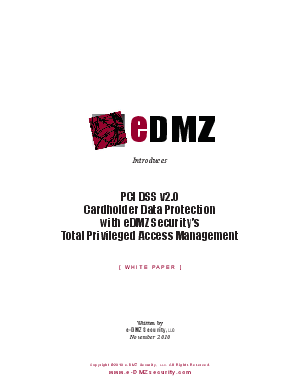 > e-DMZ Security LLC > PCI DSS v2.0 requires full control, audit and monitoring of privileged users and their access. PCI DSS v2.0 requires full control, audit and monitoring of privileged users and their access. PCI requires enterprises control and manage privileged users, audit and monitor internal and/or external access to cardholder data. Host controls are not sufficient. This whitepaper discusses how e-DMZ Security’s Total Privileged Access Management enhances host controls to deliver PCI compliance.